Filters let you sort auctions and select which ones you see. GoDaddy has added a new filter tool to its domain investor app. It is now live on the iOS app and coming soon to Android. With the filter, users can sort listings by price, alphabetically, or by time. They can also choose to show just the expiry auctions or also member listings. 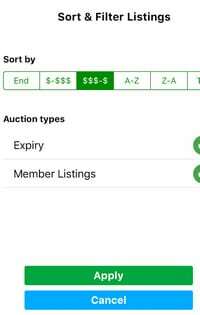 GoDaddy added the filter because it recently added support for public listings (make offer) in the app. This coincides with changes GoDaddy made to the offer/counter offer pages earlier this month as covered by DomainInvesting. The sort and filter tool doesn’t quite show up right on my iPhone 6 screen but it is usable. Meanwhile, over at NameJet, I believe the company has added fixing the bug in its app where you don’t get alerts on its roadmap to fix by 2025.